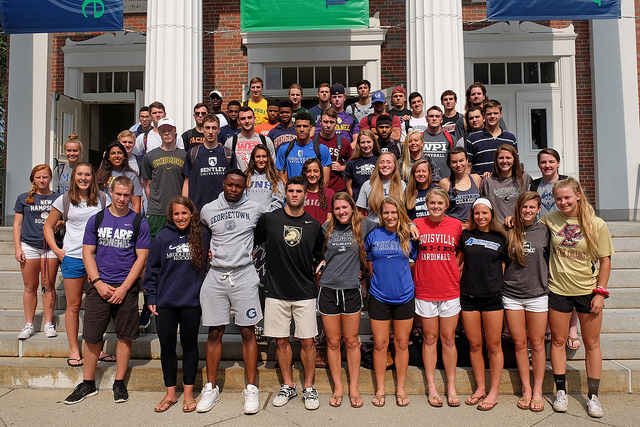 As the school year closes, we’ve been reflecting on what a fine year it’s been for Williston athletics. Five seniors were recently singled out for their accomplishments at the Athletic Awards on May 27 (see photos) and a host of them are headed to colleges where they will continue to compete. We’ve had senior athletes singled out for honors, including Nick Garofano and Michael Dereus. We had champion softball and tennis teams (the softball team was interviewed on Springfield radio!). That’s what we call finishing strong! Go Wildcats! 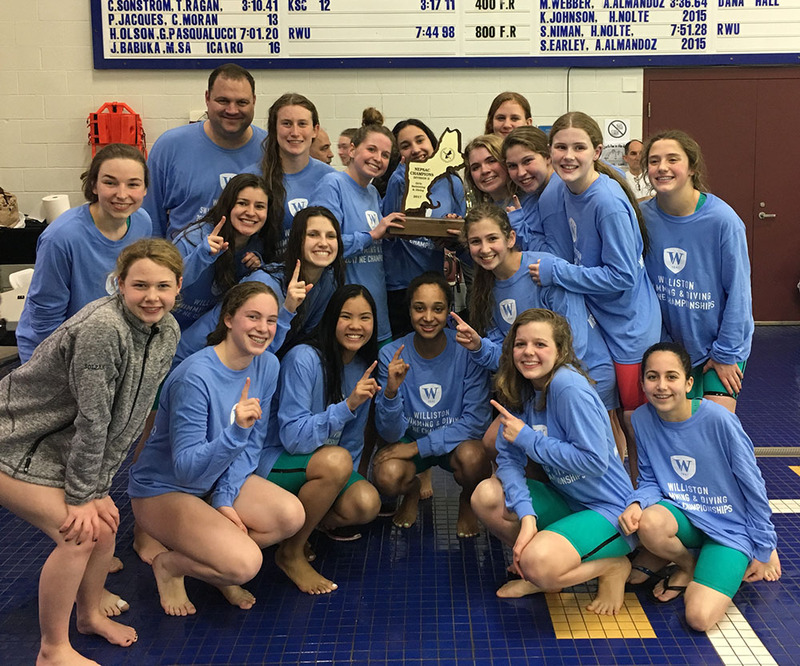 The girls swim team traveled to Rhode Island over the weekend and captured their first NEPSAC title in team history, scoring a record 431 points on route to a convincing victory over two-time defending champion Dana Hall. Each and every member of the team recorded personal best times on the weekend and the atmosphere was electric. The meet opened with the 200 Medley Relay team of Sally Alrutz, Natalie Aquadro, Maya Soley, and Anabelle Farnham setting the pace with a win in a new meet and school record time of 1:52.13. In the second event of the meet, the 200 Freestyle, Anabelle Farnham and Emily Yeager swam to a second and a fourth place finish respectively and the team was in a great position after the first two events. Natalie Aquadro picked up a bronze medal in the 200 IM, making it three years in a row that she had made the podium in this event. The 50 freestyle saw ninth grader Annika Johnson emerge as a top sprinter, finishing a strong 4th place with the 16th fastest time in school history. The diving event was held on Wednesday, but the points were added on Saturday night, as the divers put together a 1,4,6 finish including a school and meet record performance by Gabrielle Mercier scoring 455.45 and qualifying for All-American Consideration. Sally Alrutz, Maya Soley, and Jasmin Movassaghi followed up in the 100 fly with a 2,7,8 finish and the Wildcats had taken the lead. Tenth grader Anabelle Farnham then swam to a second place finish in the 100 freestyle with the fourth fastest time in school history. The race of the night, however, came in the longest event of the meet, the 500 freestyle. Trailing at the midway point, tenth grader Maya Soley overtook the defending champion in the event down the stretch to win her first individual NEPSAC title after dropping her best time over 10 seconds to finish with a winning time of 5:24.96. The team of Annika Johnson, Jasmin Movassaghi, Emily Yeager, and Maya Soley then put together a 2nd place finish in the 200 Freestyle Relay. As the meet was drawing to a close and the result still in doubt, the final events were riveting. 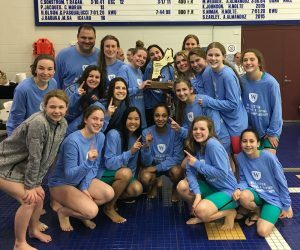 Ninth grader Sally Alrutz won her third individual NEPSAC title winning the 100 backstroke, followed by a strong 10th place finish by senior Leeanna Albanese. The breaststrokers then took over to seal the victory for the Wildcats. Natalie Aquadro led the way with a second place finish marking the fourth year in a row she has finished either first or second in this event. She was followed by Sabrina Liew in 8th and Skylar Nieman in 10th place and their 35 combined points put the meet out of reach for the rest of the schools. The final event of the night saw the team of Sally Alrutz, Emily Yeager, Natalie Aquadro, and Anabelle Farnham convincingly win the 400 freestyle relay in a school record time of 3:40.59 to close out an incredible night of swimming. The boys swimmers had plenty of highlights on the night as they swam to a 5th place finish in a very competitive meet. Junior David Fitch was named the Babcock Award winner as the Outstanding Performer of the meet as he put together school and meet record performances in the 50 Freestyle (21.10) and 100 Freestyle (46.88). Fitch’s time in the 100 Freestyle qualifies him for All-American consideration. The 200 Freestyle Relay team of Calvin Frye, Chris Lansill, Mark Wei, and David Fitch took home the NEPSAC title in thrilling fashion as Fitch entered the water in third place and anchored the relay in a blistering 20.40 seconds, the fastest relay split in team history. The 400 Freestyle Relay team of Calvin Frye, Jason Albanese, Chris Lansill, and David Fitch also made the podium with an impressive third place finish. Every boy on the team scored points and swam great as the team looks to build on a strong performance heading into the offseason. Two Williston Northampton teams have qualified for post-season play, which begins on Wednesday. 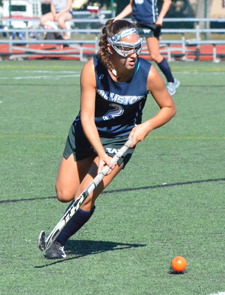 Varsity field hockey (11-3-2) is seeded fourth in Class B and will host fifth-seeded Hopkins School. The game will be played at Galbraith Field at 2:15 p.m.
Field Hockey is carrying a six-game winning streak into the playoffs, and finished the regular season as the Class B Western New England Prep School Field Hockey Association (WNEPSFHA) Champions. Positive momentum, and home field advantage, should serve them well for their opening-round game. Some of the most memorable games this season include a 3-2 comeback win against Deerfield in overtime, a 3-1 win against Loomis Chaffee, and hard-fought 1-1 tie against Class A tournament #1 seed Hotchkiss. Our Wildcats have a good deal of big-game experience, and this should serve the girls well as they begin their playoff campaign. 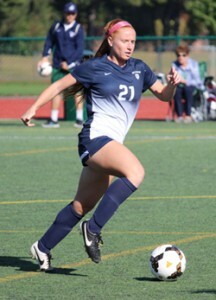 Girls var sity soccer (10-3-2) is seeded fifth and will head to face fourth-seeded Pingree School this Wednesday. Kick off is at 2:00 p.m. 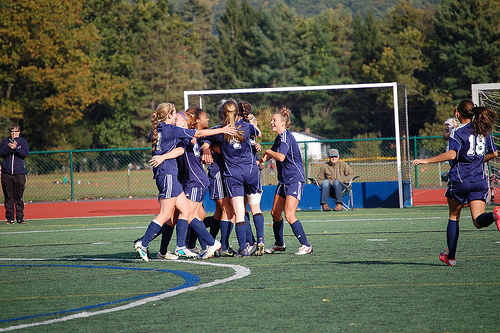 The girls should be congratulated on a great regular season, during which they won the Class B Womens Western New England Prep School Soccer Association (WWNEPSSA) Championship. Some of the most memorable games this season include the Friday night 3-0 win against Wilbraham & Monson under the lights, and a pair of 1-0 wins over powerhouses Westminster and Loomis Chaffee. With three wins in their last four games, the girls are looking to carry their own momentum into the playoffs. A positive and enthusiastic team spirit, fostered by coaches Jen Fulcher and Monique Conroy, has been an important factor in the team’s success this season, and the girls will have to harness that enthusiasm throughout the playoffs in order to overcome their opponents. Williston wishes both teams the best of luck as they compete for silverware this week. 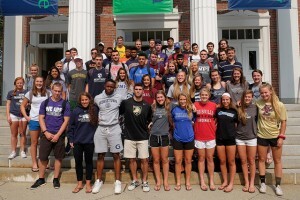 For further information on all NEPSAC Tournaments go to the link below. Photo by David Koritkoski of the award-winning relay teams from the Bud Erich Invitational on February 28. 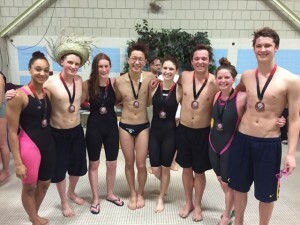 The boys and girls swim teams competed in the NEPSAC Division II Swimming and Diving Championships at Roger Williams University on Saturday, March 7, 2015 and had a very successful day. The girls finished in second place behind three-time defending champions Dana Hall, and the boys finished in sixth place. The girls 200 Medley Relay team of Sally Alrutz, Natalie Aquadro, Jasmin Movassaghi, and Emily Yeager opened up the meet in style, winning the event while setting a new school record. 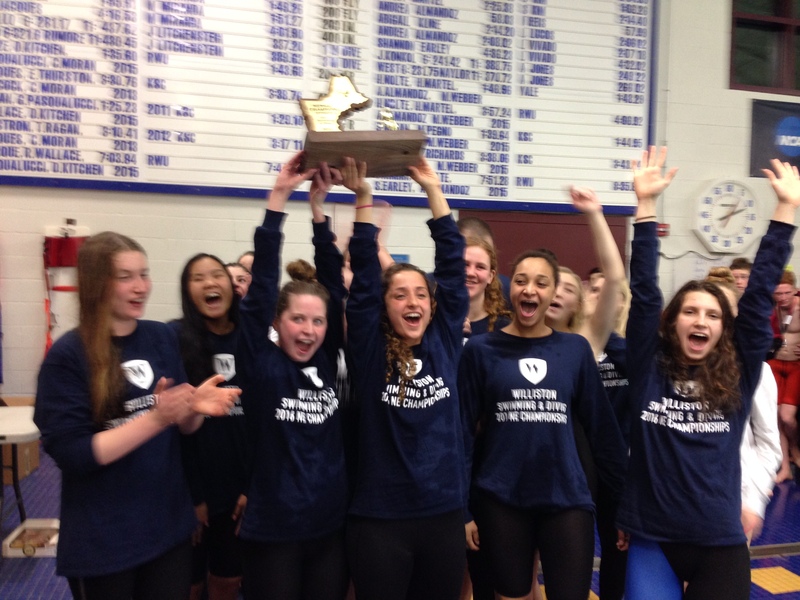 They also broke the previous NEPSAC Division II record by over three seconds, with a blazing fast time of 1:52.88. Eighth grader Sally Alrutz (Springfield) put forward an incredible individual performance, winning a NEPSAC title, setting a Division II record, and breaking a 15-year old school record in the 100 butterfly with a time of 59.12. She followed up that swim with a second place finish—and a new school record—in the 100 backstroke with a time of 58.90. Sophomore Natalie Aquadro (Northampton) took home a pair of second-place finishes in the 200 Individual Medley (2:15.74) and 100 breaststroke (1:09.19), and had the second fastest time in the event in school history. Sophomore Emily Yeager placed third in the 200 Freestyle (2:0287) and fourth in the 100 backstroke (1:03.17). Freshman Anabelle Farnham (Amherst) placed third in the 50 freestyle with a time of 25.83 and finished fourth in the 100 freestyle with a time of 55.37. On the boys side, the 200 and 400 freestyle relay teams of David Fitch, Calvin Frye, Alex Li, and Chris Lansill put together impressive performances, finishing fifth in both events with times that rank them in the top 15 in school history. Sophomore David Fitch (Conway) swam two incredible races. He won his first NEPSAC title in the 100 freestyle with a time of 48.71 and finished second in the 50 freestyle with a time of 22.15. Junior Calvin Frye (West Springfield) placed third in the 200 freestyle (1:52.17) and eighth in the 100 freestyle (51.69). Junior Chris Lansill finished off a great season, winning the consolation final of the 100 backstroke finishing 9th with a career best time of 1:02.90 and anchored the 200 Medley Relay team with a season best time of 23.83. Senior captain Alex Li (Longmeadow) capped off a great Williston career, finishing sixth in the 100 butterfly (59.84) and fourth in the 100 backstroke (1:00.32). 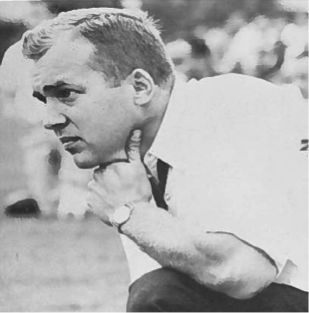 Coach Ray Brown, who was known to heft more than a few victory cups in his time, has been inducted into not one, but two halls of fame. Both were nods to his long, winning records as the boys soccer coach (1965-1993) and girls basketball coach (1976-2002). 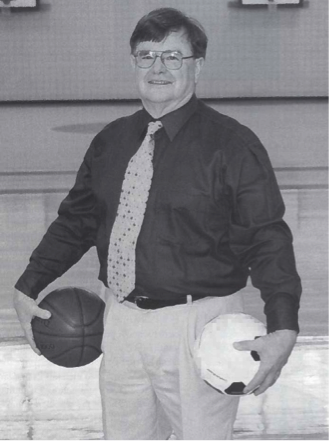 After attending Williston Academy as a post-graduate with the Class of 1955, Coach Brown played soccer and basketball at Kenyon College. 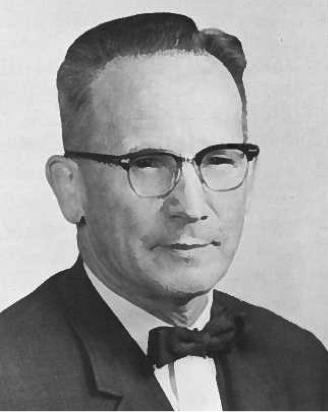 He returned to Williston in 1959, where he would remain for the next 43 years. Coach Wilmot “Babs” Babcock certainly knew how to win, accumulating an astounding 341-47-2 record over the course of 20 years. After starting the Williston swimming program in 1951, Coach Babcock took the team to 15 New England Championships — 11 of them in a row. This legacy also produced 15 national prep champions.